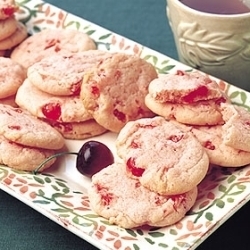 cerise Icebox biscuits, cookies. cerise Ice Box biscuits, cookies from Collin rue Bakery. Wallpaper and background images in the biscuits, cookies club tagged: cherry cookies collin street bakery cookies cookie. This biscuits, cookies photo contains dinde, dîner de dinde, dîner de turquie, nuggets de poulet, pépites de poulet, biscuits, and cookies.